I wanted to take a picture of the pudding plated, but it smelled and tasted so good that it was gone before I had a chance. 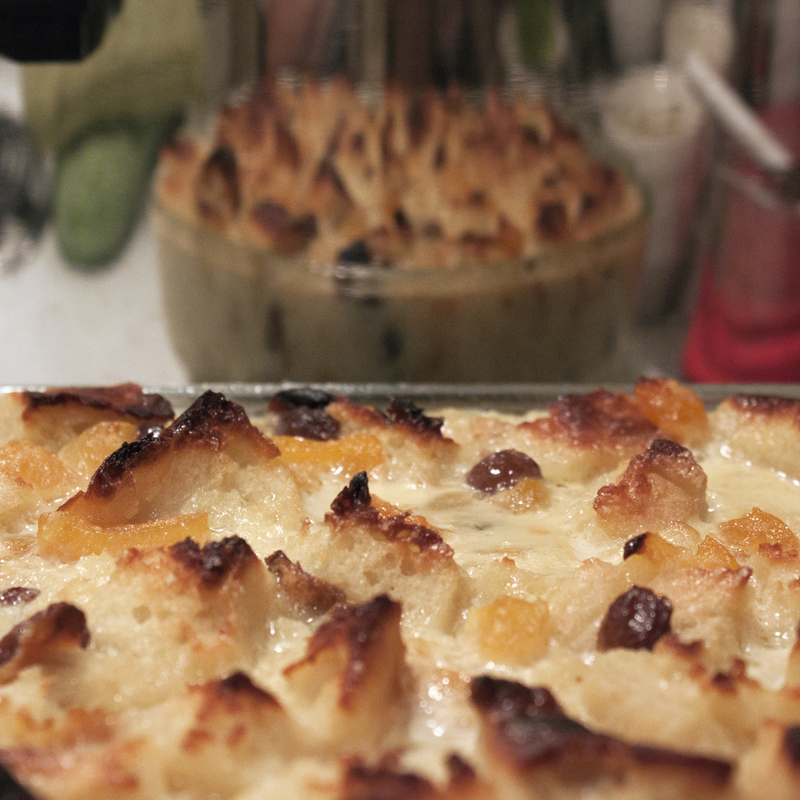 I combined two great bread pudding recipes – one from Simply Recipes and one from Gourmet – to make this amazing dessert. Cut enough 1-inch pieces from baguette to measure about 5-6 cups. Stir together eggs, butter, 2/3 cup sugar, and salt in a large bowl. Then whisk in cream, milk, and vanilla. Add bread and soak, stirring occasionally, 15 minutes. Meanwhile, boil brandy and water with dried fruits in a small heavy saucepan until liquid is reduced to about 2 Tbsp, 8 to 10 minutes. Cool slightly. Stir fruit mixture into bread mixture, then transfer to a 2 Quart baking dish. Bake until custard is set and bread is golden in places, 45 minutes to 1 hour. Cool slightly before serving. yum. i had seen this in a couple places before, but not taken the initiative to make it happen. it just so happened that after making granola this afternoon, i had a few almonds left over, 6 apricots left in the package, and a hankering for chocolate. it was insanely easy to make (and kinda fun) and tasted SOOOO good. dip the apricot in melted chocolate, sprinkle with chopped nuts, and place on plate in the freezer or refrigerator for chocolate to harden.